One week left before it's time to get really serious, but, until then, we might as well enjoy the race to the finish line to determine which team will earn the right to play for the Stanley Cup in 2008. One team sprinting to the end is the Washington Capitals, who likely need to win their final three games to even have a shot at gaining a postseason berth. At the dizzying pace Washington coach Bruce Boudreau has his charges playing since taking the reins, you would think that shouldn't be too tall an order. Not only has Boudreau guided the Capitals to 16 come-from-behind victories since taking over for Glen Hanlon on Nov. 22, but the team is 34-17-7 under his tutelage. Washington's 3-0 victory over the Florida Panthers on Saturday was its 40th win of the season, the most since the franchise's last playoff appearance in 2002-03 when it also finished with 39 wins. "We are not in a playoff position yet, but we want to get there and we believe we are going to be there, but the Stanley Cup is our prize; not making the playoffs," Boudreau said. "Even though people outside of our dressing room would firmly believe that if we made the playoffs, it would be a great accomplishment, our goal is to win the Stanley Cup. If you keep winning, eventually you're going to gain ground, and if you look now in the last two weeks, it's all divisional play so as long as you do your job and win, you will gain on somebody." Washington, which is 8-2 in its last 10 games, concludes the season with a three-game homestand beginning tomorrow night against Southeast Division-leader Carolina. The Hurricanes, in fact, are just two points ahead of the Capitals for the regular-season division lead. The contest heads NHL.com's final edition of Six Pack for the 2007-08 regular season. Just think -- this time next week we'll be debating playoff matchups. It's crunch time, people! Colorado Avalanche at Vancouver Canucks (Tuesday, 10 p.m. ET, VERSUS) -- In case you missed it, Colorado coach Joel Quenneville moved Peter Forsberg on a line with Ryan Smyth and Milan Hejduk and, presto, the trio combined for nine points and three goals in a 6-3 win against the Canucks last week. Needless to say, Quenneville will likely keep that second offensive unit intact down the stretch. Forsberg, who sat out the first four months of the season because of a right foot injury and is coming off a strained groin, said he's finally skating better. That's not good news for the Canucks, who lost center Brendan Morrison for the remainder of the season after he tore a ligament in his right knee during the setback to Colorado. Vancouver holds a one-point edge over Nashville for the eighth and final playoff spot in the West. Colorado, third in the Northwest Division and seventh in the conference, has won five of its last 10 games. 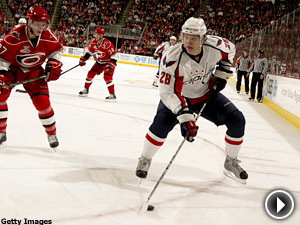 Carolina Hurricanes at Washington Capitals (Tuesday, 7 p.m. ET) – The Capitals, who will certainly be watching the scoreboard all week, are three points from an eighth seed in the East with three games remaining. Alex Ovechkin (62 goals) -- the League's leading scorer and the first player in 12 years to reach the 60-goal mark -- broke Dennis Maruk's 26-year-old Washington record for most goals in a season. Ovechkin, in fact, received a call from Maruk prior to setting the mark. "He called me after the warm-up, after morning skate," Ovechkin said. "He told me good luck, congratulated me. He tells me just to keep going and don't stop pushing forward." Not to be forgotten has been the play of Washington netminder Cristobal Huet, who is 7-2 in his nine starts since joining the Caps a month ago in a Feb. 26 trade with Montreal. Huet has allowed two or fewer goals in seven of his nine starts and has not allowed more than three in any of them. The Hurricanes are 7-2-1 in their last 10 games, first in the Southeast Division and third in the Eastern Conference. Carolina, which won the Stanley Cup in 2005-06, did not qualify for the playoffs last season. Philadelphia Flyers at Pittsburgh Penguins (Wednesday, 7:30 p.m. ET, TSN, RIS) -- Did you know the three highest-scoring games for Pittsburgh this season have come while Sidney Crosby was sidelined with a sore ankle? In addition to putting up seven on Buffalo and New Jersey, the Penguins also embarrassed the Flyers in their most recent meeting on March 16, when five different players connected in a 7-1 trouncing. The Penguins, seeded second in the Eastern Conference, have taken the last two games between the teams, but still trail in the season series, 4-2. The rivals will meet for the eighth and final time on April 6 in Philadelphia. The Flyers are 5-0-1 in their last six and stand seventh in the Eastern Conference playoff race with three games remaining. Center Daniel Briere has five goals and three assists in his last five games. "Confidence is a huge part of success in this League," Briere told NHL.com. "Now that the (10-game) losing streak is behind us, we are thinking positively and playing with confidence; it's been completely different." The addition of winger Vaclav Prospal from Tampa Bay last month has also played a big part. The 33-year-old on Czech has three goals and four assists in his last six games. Additionally, goalie Martin Biron is 3-0-1 in his last four starts. Calgary Flames at Minnesota Wild (Thursday, 8 p.m. ET) – Minnesota is three points ahead of Calgary in the Northwest Division and is seeded third in the Western Conference. The sixth-seeded Flames have been led by Hart Trophy candidate Jarome Iginla, who has 11 goals in his last 11 games and is third in the League in goals (49) behind Atlanta's Ilya Kovalchuk (50) and Washington's Alexander Ovechkin (62). The Wild have recently been spurred by the play of third-line winger Branko Radivojevic, who has scored five points and three goals over his previous seven games. Minnesota wing Marian Gaborik leads the team in goals (40), points (80) and plus/minus rating (plus-16). On March 28, Minnesota President and General Manager Doug Risebrough announced the signing of center Colton Gillies, the nephew of former New York Islanders legend Clarke Gillies, to a multi-year contact that will begin next season. San Jose Sharks at Dallas Stars (Sunday, 3 p.m. ET) – After snapping a six-game home losing streak against the Stars at HP Pavilion last Thursday, the Sharks will now look to get the job done in Texas where they are 3-0 this winter. The Sharks are 16-0-2 in their last 18 games and are virtually assured the second seed in the Western Conference. Goalie Evgeni Nabokov has appeared in a career-high 73 games while leading the League with 44 victories. Defenseman Brian Campbell has 14 points (12 assists) in 15 games since joining the Sharks on Feb. 26. The Stars have lost five of six, leaving them 2-7-1 in their last 10, and are fifth in the West. Mike Modano has 10 points (five goals, five assists), including two game-winning goals, in the season series against San Jose this year. New York Rangers at New Jersey Devils (Sunday, 3 p.m. ET, TSN) -- The Devils are struggling to not only earn a victory but score a few goals. The team is 4-5-1 in its last 10 and has scored just 21 goals over that stretch. New Jersey dropped its seventh straight against the Rangers last Thursday (0-4-3) and will try to avoid the sweep when the teams close out the eight-game set at Prudential Center. The Rangers, who last defeated one team (Toronto) seven times in a single season 40 years ago, are currently sixth in the East with 91 points. Fifth-seeded Ottawa is one point ahead of the Rangers and the Flyers and Bruins have pulled even with New York with 91 points. Confused yet? The Rangers and Devils have played two one-goal games and two games decided via shootout. "Against a team like this, I think what wins out is to try and stay composed and poised and work hard within our structure," Rangers coach Tom Renney told newyorkrangers.com. "It seems as games go on against these guys, we believe in that even more so. When it comes to the wire, we almost get a rush from it." Historical hit of the week -- On April 4, 1987, Denis Potvin of the New York Islanders scored twice in a 6-6 tie with Buffalo to become the first defenseman in NHL history to record 1,000 career points. Denis ended his Hall of Fame career with 1,052 career points and 742 assists in 1,060 games.